Juliana Philippi in De Profundis. Photo by Charlotte Arnoux. BOTTOM LINE: Linked across time by an enchanted mirror and a mysterious mermaid, two couples face desire, ambition, and separation. From myths of seductive sirens to tales of lovelorn sea nymphs, mermaids, music, and desire are inextricably linked in the popular imagination. But what if these creatures craved our songs as much as we did theirs, and were just as willing to risk their lives for our music? 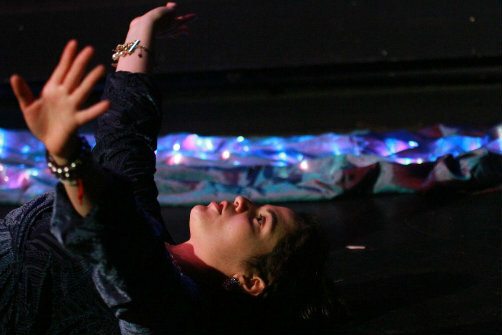 The magical-realist play De Profundis offers such a twist on conventional fables, crossing eras and oceans in the overlapping narratives of two star-crossed couples and a sound-loving mermaid. Beginning in near darkness, De Profundis establishes the connection between sound and longing early on, as two men wield halogen lamps and call out to their respective lovers. Guy (Adrian Burke), the younger of the pair, has inherited a dilapidated theatre on Staten Island, and is now renovating it with the help of his girlfriend Clementine (Therese Dizion). Their exploration of the building reveals a mysterious mirror, previously owned by Antonio (Jim Sherwood) a turn-of-the-century Cuban sound designer. Fueled by the mirror’s prophetic visions, Antonio traveled to America in search of new markets for his inventions and solace for his terminally-ill bride Esterre (Rosanne Rubino). Now, Guy and Clementine seek the mirror’s wisdom as ambition and wanderlust place these childhood sweethearts at a similar crossroads. Like the mirror, an enigmatic mermaid (Juliana Philippi) links the stories across space and time. Having forsaken her watery home for the sounds of the surface, she journeys through De Profundis’s action as both narrator and participant. Whether appearing as muse to Antonio and Guy, as kindred spirit to the ailing, visionary Esterre, or as Clementine’s shell-collecting grandmother Lyndall, Philippi infuses the role with striking grace and infectious delight in the creations of man and nature. The twin love stories are no less captivating, with Burke and Dizion’s easy chemistry nicely balancing Sherwood and Rubino’s passionate devotion. De Profundis’s celebration of sound finds its full expression in writer/director Ran Xia’s lyrical text and Adrian Bridges’ ethereal audio design. Spanish guitars punctuate the music of waves and rain, blending with Antonio’s shell-and-pin-needle symphonies in multi-layered harmony. It comes as no surprise that the script takes cues from historical and modern poetry: descriptions of whale songs, “stone piano” rock formations, and memory-infused sea urchins hold as much tender beauty as the Lorca, Tennyson, and Matthea Harvey passages which inspired them. Like the hybrid creatures it evokes, De Profundis beckons from a dreamlike liminal world, its characters caught between tantalizing futures and pasts they cannot easily relinquish. Though the pursuit of love, inspiration, or a better life may similarly suspend us, we must, as Lyndall advises, remember that such sea-changes are ultimately worth the risk. De Profundis is written and directed by Ran Xia and presented by The Midtown International Theatre Festival in conjunction with The Arctic Group. Assistant Director is Charlotte Arnoux. Sound Design by Adrian Bridges. Costume Design by Florence Le Bas. The cast is Adrian Burke, Juliana Philippi, Jim Sherwood, Roseanne Rubino, and Therese Dizon.